I'm having so much fun with these - just drybrushing and washes. Just the way I like it! Good start. They fit in perfectly so far with the rest of the warband. And they're huge too! Cheers guys! Glad you like 'em! This is possibly your best project so far - very well done! I think my favourite project so far is the ongoing nurgly 40k retinue. But we´ll see when it´s done - I´m not distanced enough to judge at the moment... It has been a lot of fun to go back to fantasy for while though. 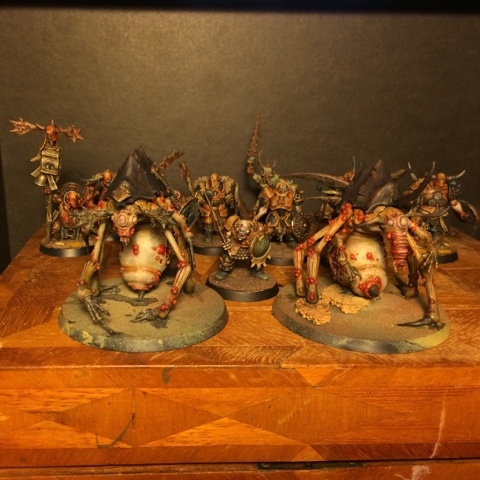 Those are great and makes me wonder why that never occurred to me for Nurgle spawn. Awesome work! Your paint job is stellar as usual and I'm looking forward to seeing how your games go. May Grandfather favor your dice rolls.